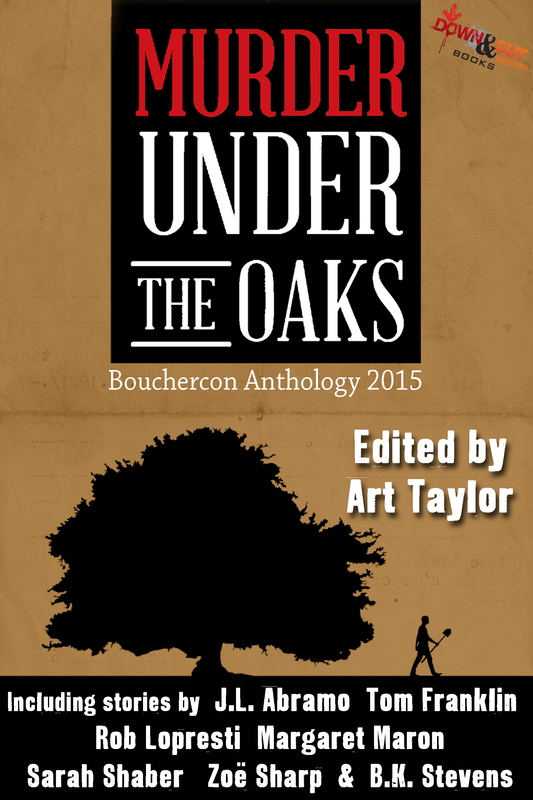 "Down Home," by Toni Goodyear, in Murder Under The Oaks: Bouchercon Anthology 2015, edited by Art Taylor, Down and Out Books, 2015. I have a story in this anthology. 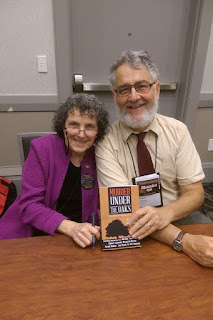 This photo, taken by Gigi Pandian and used with permission, shows me sitting with Toni Goodyear at the mass signing for the book at the Bouchercon. We happen to be next to each other in the book, and therefore sat together on the assembly line. Last week I wrote about a tale in it that I described as sweet and twisted. You might say we're back in that territory again. Greta is an eighty-year-old widow with a problem: Andy Griffith keeps trying to arrest her. That's right, the dead actor. He's dressed as Sheriff Andy Taylor from the old sit-com, but Greta realizes that that was only a character he was playing. Heck, she's not crazy. So naturally she had to set her sofa on fire to escape him. Wouldn't you have? The doctor says she is suffering "transient paranoid disturbances," but she is more bothered by what she calls "occasional invisibility," as cops, doctors, and relatives find it convenient to talk over and around her. Okay, Greta clearly has a clinker in her thinker, but this is a crime story. What crime could involve a sweet old lady who empties into her .22 Ruger into the wall of the laundry room, gunning for the sheriff of Mayberry? A wild and satisfying ride. "#grenadegranny," by Karen Pullen, in Murder Under The Oaks, Bouchercon Anthology 2015, edite by Art Taylor, Down and Out Books, 2015. I have a story in this anthology. Ms. Pullen's tale is a heartwarming story of disease, robbery, blackmail, and other disasters. Trust me. Martha Sue's life is a mess. Failing business, runaway husband, furious ex-best friend. Everything changes when she is diagnosed with terminal cancer. Her neighbors, all of whom have financial problems of their own, come through in a big way for her. So, it seems like the least she can do for them is rob a few banks. After all, what's the worst the law can do to her: Put her in prison and give her free medical care? Funny and sweet, in a twisted way. 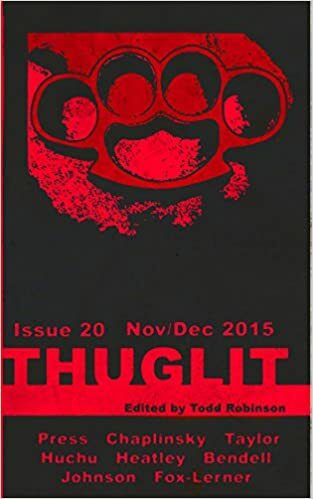 "Letters to the Purple Satin Killer," by Joshua Chaplinsky, in Thuglit 20, 2015. A funny story on a sad subject: people who obsess about serial killers. Jonas Williker is on trial for multiple murders and his correspondents (almost all women) can't get enough of him. There is a twelve-year-old who wants him to embrace Jesus. His mother assures him that she is confident he is innocent. (She is watching Oz to keep informed of his situation.) Staci, well, Staci is very blunt about what she wants but I can't repeat her requests here. Then there is Ginny who tells him about the two kids she adopted ("The approval process is faster for [special needs children], because no one wants them," and says "Whenever I get a letter from you I turn on Court TV and turn the volume down, so I can read it out loud and pretend you're talking to me." And then there is Candace, a PhD student who wants to study women who are sexually attracted to criminals. Purely for academic reasons, of course. Horrible people. Damned funny story. "Gold Leaf," by Luanne Rice, in Providence Noir, edited by Ann Hood, Akashic Press, 2015. "The women of Fox Point wore black because someone was always dying." Nice opening line for a noir story, or a book of the same, true? This is a tale about making a deal with the devil. Not literally, but about setting a cat to catch a rat, which always leaves you with a cat to cope with. The narrator is an artist. "I worked in shorts and my bra, making portraits with the bodies of angels and the heads of local politicians. I received good commissions but it didn't matter because my boyfriend was a lobbyist. He paid my rent." Very nice writing in a clever story. "Everything is Bashert," by Heywood Gould, in Jewish Noir, edited by Kenneth Wishnia, PM Press, 2015. I have a story in this book, but let's talk about Mr. Gould's. If Yiddish writer I.B. Singer collaborated with my pal R.T. Lawton on one of the latter's Holiday Burglar stories, the latter might be something like "Everything is Bashert." Lawton's heroes are a couple of burglars whose brilliant plans always go to sheol. Gould's Franny and Larson are two petty lowlifes who like to spend their days at Aquaduct. And it is at that race track one day that they run into a hasidic gentleman they call the rabbi (he isn't). The rabbi has a Bible-based system for betting on the horses, a sure thing of course, and yet somehow he is short of money. Go figure. Our heroes lend him some cash and, well, a wild ride commences that involves among other things, breaking into a morgue, and ends with a sort of spiritual enlightment. "We're committing a mortal sin." "Not our first. Might as well get rich doing it." A treat from start to finish.